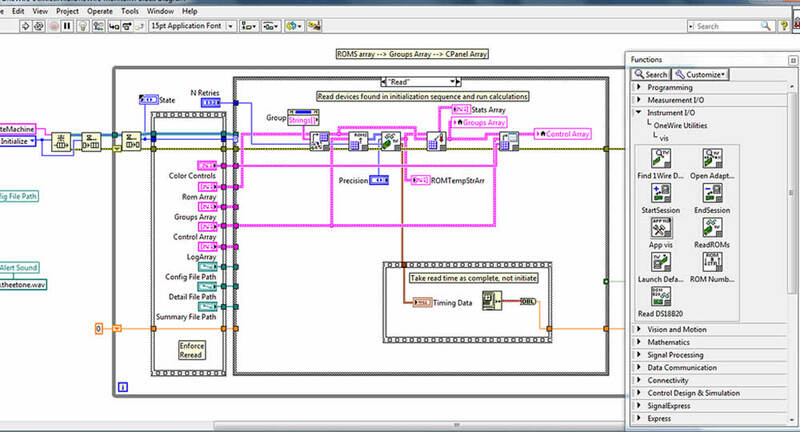 We have designed a flexible and versatile LabVIEW application development toolkit and suite of applications for use of one-wire sensors in whatever environment the user sees fit: data acquisition instrumentation, hobby, general environmental monitoring, or otherwise. We've optimized it for speed on multi-sensor networks and added in examples and help to get you going. We have used the basic toolkit to create a wide variety of interfaces over the years, in scientific applications as well as for hobbies. Our toolkit and standalone OneWire Monitor executable are in use in a wide variety of industries, including semiconductor manufacture, remote conditions monitoring deployments, and for monitoring drying technologies. Our toolkit employs the TMEX API and includes native function calls, so if your sensor is 1Wire, it will work with OneWire Utilities! 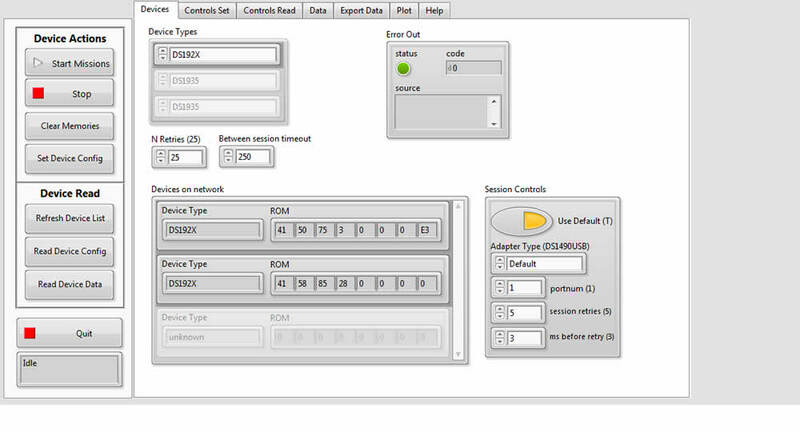 Use our ROM utility or palette functions to configure your sensor network. 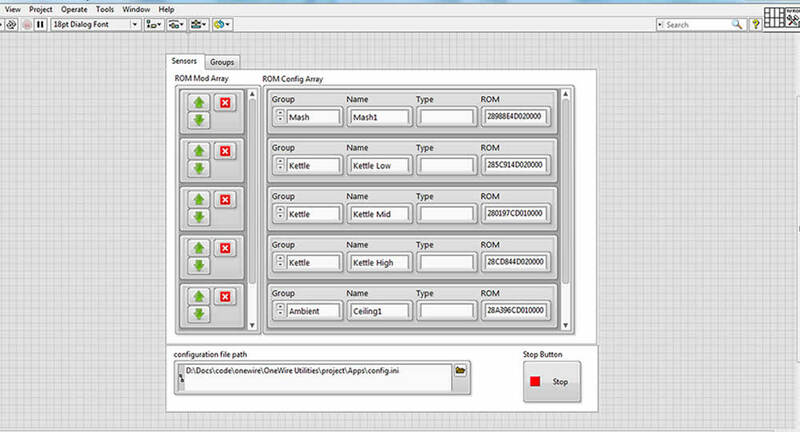 Assign nicknames and group sensors and save into a local .ini file for easy retrieval of multiple configurations. The toolkit comes preconfigured to read a number of sensors from common adapters such as the DS9490R and iButtonLink LinkUSB adapters, and also allows access to the base TMEX API function calls for customized applications. See below for compatible devices. Use our controls and type definitions to put together custom applications for your acquisitions environment. Many examples are included with our toolkit, including a OneWire Monitor and configuration application. We're also happy to help develop your custom acquisition tools. For more details on these applications, scroll down to their descriptions below. Each instance requires a RunTime license (available in our web store), and can be easily installed as described here. A 15-day trial is automatically started on install, so you're free to give it a try! Dallas/Maxim DS9490, iButtonLink LinkUSB® Adapters, and all other devices based on DS9097E, DS9097U, DS1410 on USB, Parallel, and Serial ports are supported. See here for how to find and select your adapter using the toolkit or executable programs. All (yes, all) other sensors are supported using native API calls with the Open and Find Devices and other utility vis. Send us an email if you'd like to see advanced support for devices in your application. Chances are we've got some code we can make work for you. 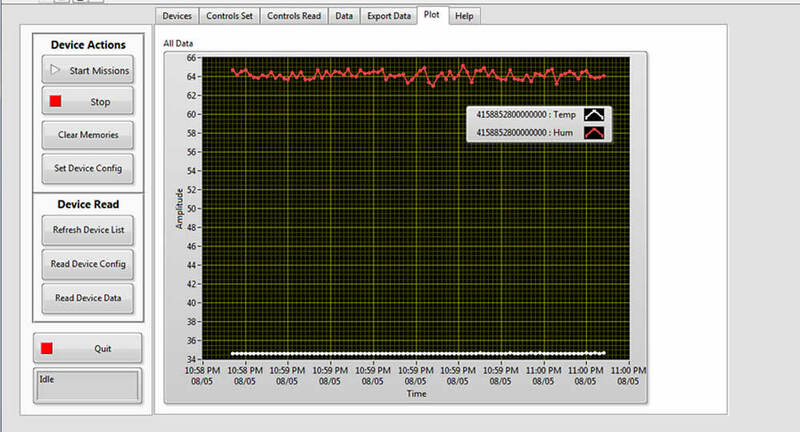 Our 1Wire Monitor application offers a standalone executable program that allows you to monitor as many sensors you can read on a 1Wire network. 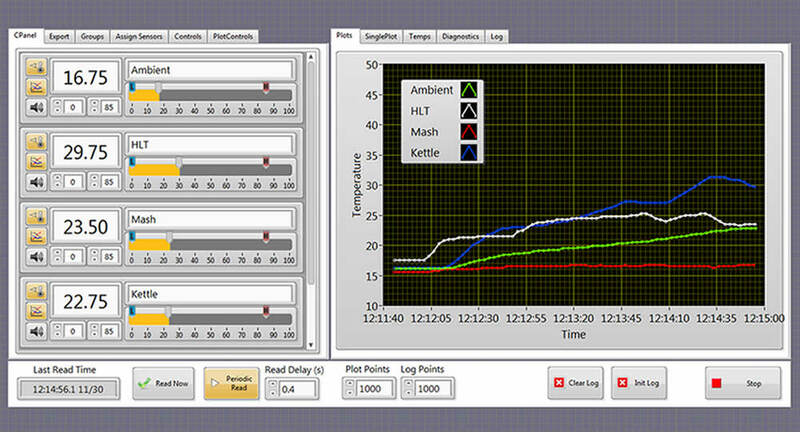 It's what we use around here to monitor our homebrew, while we brew it and after it hits the fermenters! 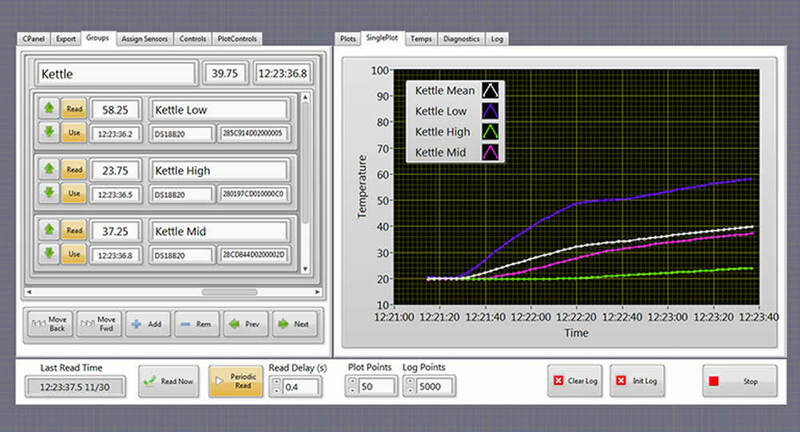 It allows read and grouping of multisensor devices from iButtonLink, as well as multiple values from one device, for example Temperature, Voltage and Current from DS2438 devices. Use our ROM sensor management features to assign nicknames to your ROMs. Even if you move them around, their unique hardware addresses and your stored nicknames will let you keep track of them. Group them together in your applications to measure positional variation and establish a standard error for your data reporting. Use our custom high/low slider controls for your group measurements to alert you visually and by audio alarm and/or Text to Speech if you wish. Save multiple groups and descriptions in multiple configuration files for quick changes and for porting custom configurations to multiple machines. DS1922 and DS1923 sensors incorporate 8kb of onboard memory and programmed interval sampling of Temperature (DS1922L, DS1992T, DS1922E) and Temperature and Humidity (DS1923), with first-in first out recording and programmable resolution. Our DS192X module allows recording and export of multiple sensor data at once (dependent on button fixture), as well as programming for mission control. Built-in examples demonstrate this functionality for build of custom applications. A standalone executable is on the way for non-LabVIEW users, and is compilable for users with LabVIEW. 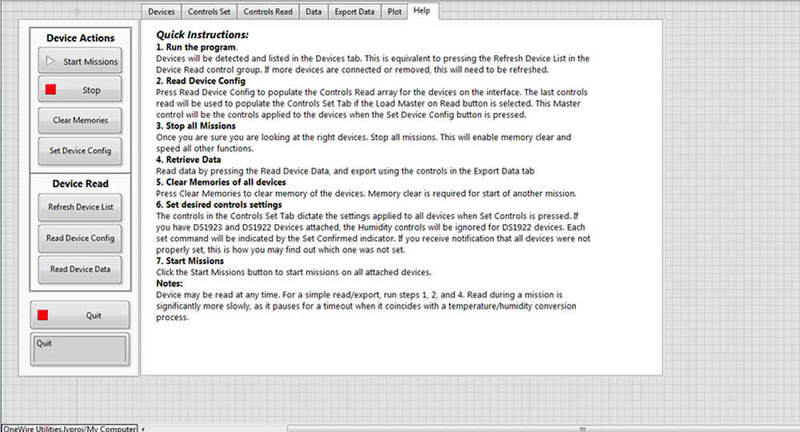 Our memory module allows access to the full feature set of function for Dallas/Maxim memory and combination memory/sensor devices listed below. 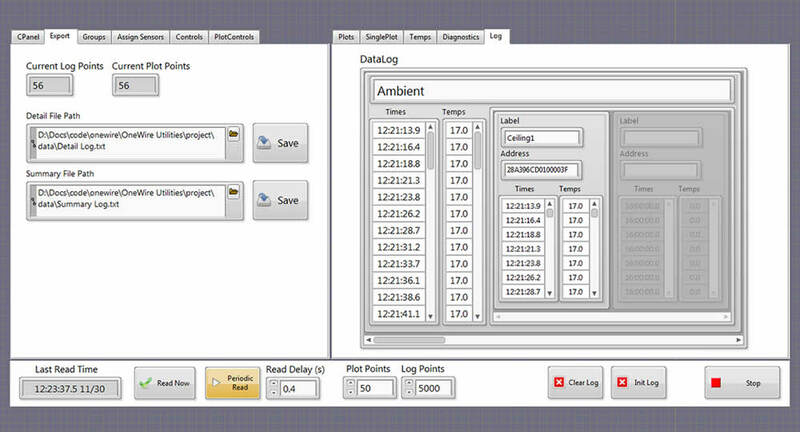 The memory module also includes our Memory Utility, a standalone application for read/write of 1Wire memory devices. 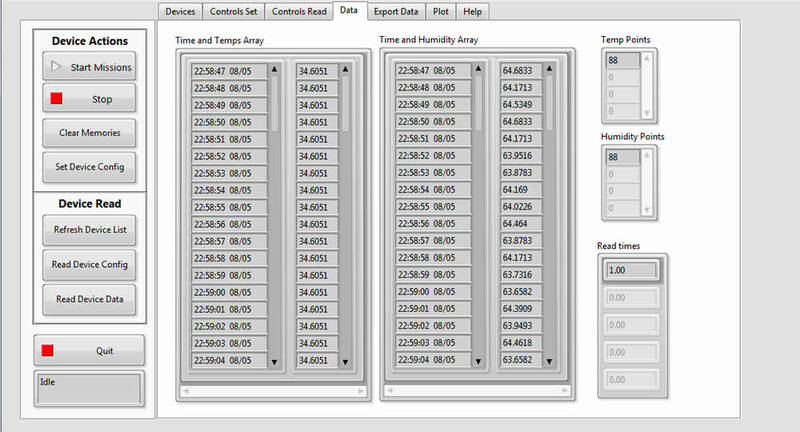 We developed the DS192X module for a customer that wanted to read/write ten devices with a single button click, both to export data, set device parameters, and send devices on missions. Even better, the application can perform all of these operations on a mix of DS1922 and DS1923 devices at the same time, converting controls as needed. 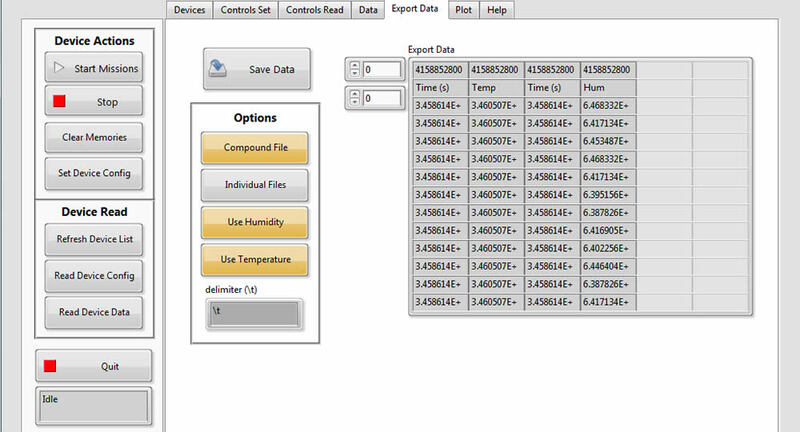 Use one control panel to program, read/write data, and mission all devices at the same time! We built our Control Panel application on top of our LabVIEW toolkit to show how to use it, and decided it should be an example for those using LabVIEW. 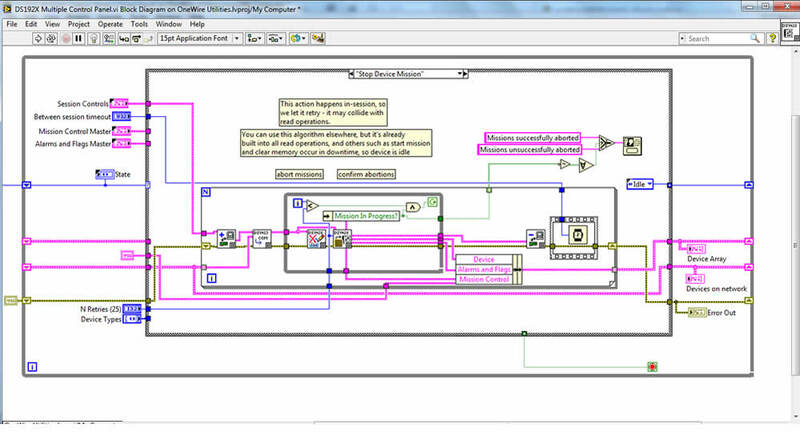 As such, you can get into the block diagram and see how it works and how you might like to modify it. It's a great way to get a jump start on your acquisition, viewing, and storage application - or just use it as it is! 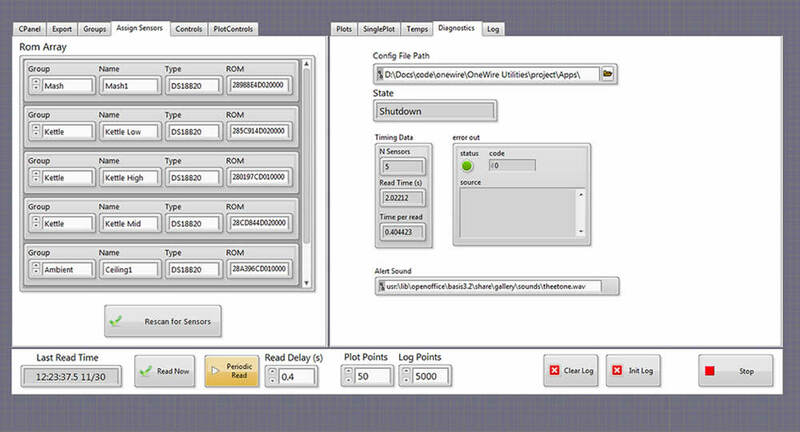 We also built it as a standalone executable that only requires LabVIEW RunTime (free). You can download it with the suite of executables at right. Click the Red Download Trial Button and take it for a spin. Also see our detailed description on the s.